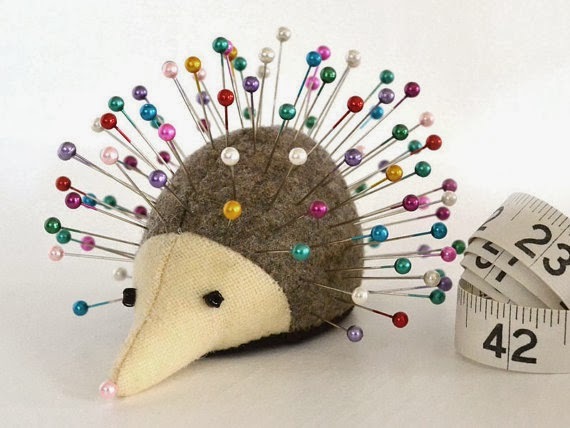 I've decided I want to make myself a new pincushion. This, understandably, is not the most thrilling announcement however the more I look into the process the more intrigued I'm becoming by even the whole idea of pincushions. Let me share with you a few random facts I've learned about our beloved pincushion. 1) The most popular design, the tomato with strawberry attached, came into being during the Victorian Era. It was a folklore that placing a tomato on the mantel of a new house would bring prosperity. Since tomatoes were a seasonal fruit women would create their own versions rolling up balls of red fabric filled with sand or sawdust. It soon turned into a practical object as it served to hold pins and needles quite well. 2) Now a days pincushions are often filled with emery sand, a fine sand helps to clean and sharpen the pins when inserted into the cushion. **On a personal note I've discovered this sand is next to impossible to find in my local city and I'll probably have to purchase online which is to bad because now I'll also have to pay for shipping. 3) In the past cushions have been filled with all sorts of objects from ground walnut shells, wool, wood shaving and even human hair. The hair was actually quite smart as it actually helped oil up the pins and keep them from rusting. During my research I discovered a few new designs and styles of pincushions I certainly would love to have in my sewing room. 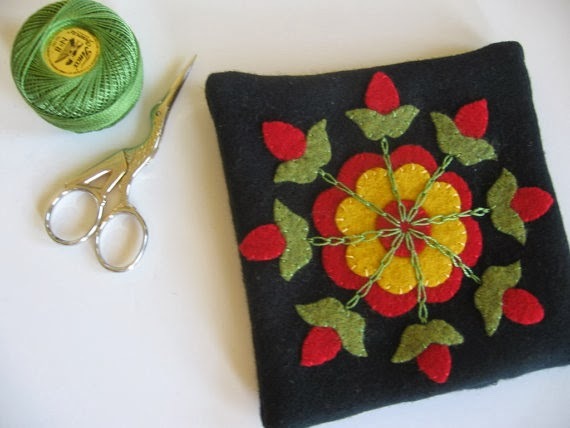 Love the primitive wool folk feel to this little pillow. 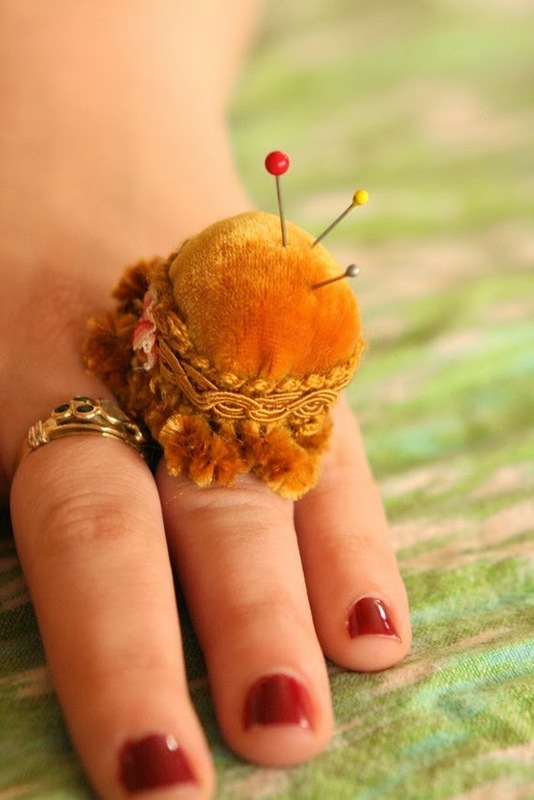 Love this Mad Hatter inspired pincushion ring. 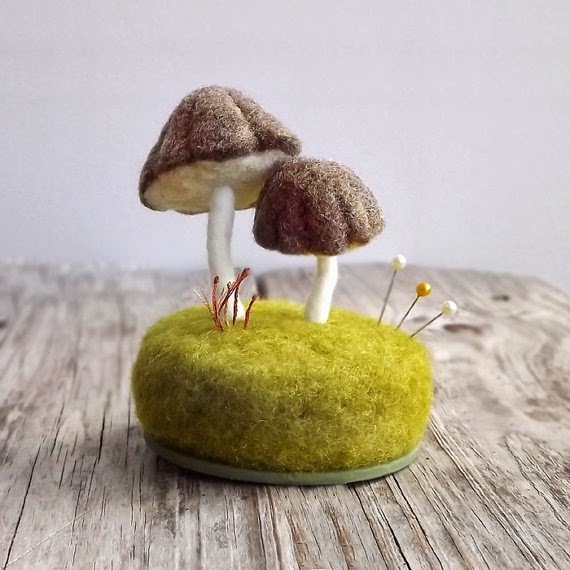 I've had my eye on this mushroom felt pincushion for awhile now. So adorable. A Hedgehog... need I say more. How cute!! I love the mushroom one and the provolone one.